Bankruptcy is a Court Process by which an individual or a business seeks to discharge or re-organize their debt. Bankruptcy provides a legal remedy to overwhelming debt. For individual debtors bankruptcy can protect your assets, save your home from foreclosure, and is most often more affordable than debt settlement or negotiation. 3. How do I know if bankruptcy is right for me? 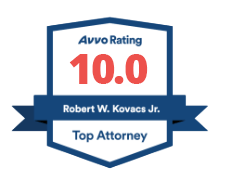 If you are having difficulties keeping up with your bills, recently lost a job, or facing foreclosure, call the Law Office of Robert W. Kovacs, Jr. for a free consultation. During the free consultation Attorney Kovacs will evaluate your case and provide you with a detailed explanation of how bankruptcy works and will affect you. 4. Will filing for bankruptcy destroy my credit? No. Bankruptcy will be a negative on your credit report; however, most people are surprised how quickly their credit rebounds. Bankruptcy is not a bar from obtaining credit in the future, rather it will be one factor your bank uses in determining if they wish to extend you credit. Many debtors are able to get new credit cards and car loans with a month or two after filing. It will likely take 1 - 3 years to get a new home mortgage after filing. 5. My house is in foreclosure. Can you help me? Yes, bankruptcy can stop foreclosure and eliminate second mortgages. If you are facing foreclosure the longer you wait to address the situation the more difficult it becomes. As soon as you know you are having problems paying the mortgage call the Law Office of Robert W. Kovacs, Jr. for a free consultation. 6. What types of debts can be discharged through bankruptcy? Most debts are discharged in bankruptcy. There are a few types of debts that do not get discharged, including most taxes, child support, alimony and student loans. 7. If I file for bankruptcy does that mean my spouse has to also? No. If you are married you can either file as an individual or as a married couple. The advantage of filing as a married couple; include saving money on legal fees, court filing fees, and counseling fees, and; eliminating all the debt for your entire household rather than just one spouse. The advantages for filing as an individual include; the non-filing spouse's credit will not be negatively impact. 8. Will I lose my house or my car? You can keep your car, house, and all your assets in bankruptcy. In fact many people that file bankruptcy due so to protect their home, car and other assets from their creditors. 9. Can bankruptcy protect me from wage garnishment? Yes. If you are currently under a wage garnishment, fling bankruptcy will stop the garnishment as soon as the case is filed. If you are being threatened with a wage garnishment, bankruptcy will prevent your creditors from ever attaching your wages. 10. Can creditors still contact me after I file for bankruptcy? No. As soon as you file bankruptcy your creditors are stayed (legally barred) from contacting you. There will be no more harassing phone calls after your case is filed with the court. 11. How long will a bankruptcy stay on my credit report? Chapter 7 bankruptcy will be listed on your credit report for 10 years and chapter 13 for 6 years. However, having a bankruptcy listed on your credit report is not a bar from receiving new credit. Most debtors are able to obtain car loans and new credit cards in 1 - 2 months after filing bankruptcy. 12. I have been sued over a debt. What should I do? You may have legal defenses to the lawsuit, including laches and the statute of limitations. Additionally, you may have counter claims against the Plaintiff which may entitle you to collect money damages. Bankruptcy may also be an alternative. Bankruptcy will stay or stop the lawsuit as soon as your bankruptcy case is filed.